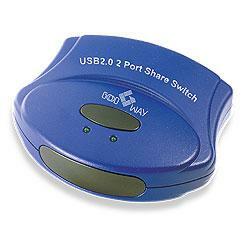 The USB manual share switch is a multi-function product. It enables you to have two computers to share a USB device (or multiple devices if you connect a USB hub to the UH826). Quickly switch between computers by a double-press of the scroll-lock key from the computer you want to have control or by pressing the button on top of the UH826. The installation is easy with Plug and Play convenience. Supports 2 computers sharing 1 device. Switch between computers by using the "Port Selector Button" or the Hot-Key. Windows 98SE, ME, 2000, XP, Vista, Apple MAC OS 9.0 or higher.